Dr Jengo's World: Assassin's Creed IV Hidden Blade Replica Revealed! Assassin's Creed IV Hidden Blade Replica Revealed! The previously announced Hidden Blade Replica from McFarlane Toys has been revealed. Not to be confused with the NECA version which was a replica of Ezio's Hidden Blades. This, of course, is of Edward Kenway who will be the Assassin protagonist in AC IV. The blade is made of plastic so.. Assassin-fanatics don't get any ideas.. It is listed at US$39.99 at Gamestop, fair price I guess. 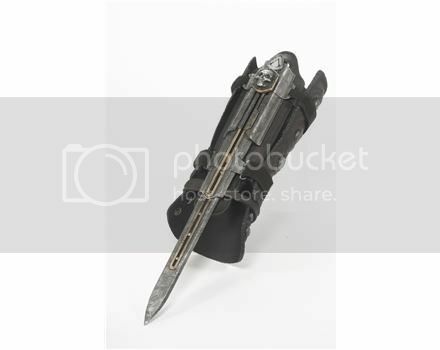 So far, I have yet to see Edward using 2 hidden blades so yet to decide if I'll get one or 2 of these...That reminds me, I have yet to get the hidden blades from NECA. All these hidden blades in my home is going to get the family panicking..
because its for halloween costume. Haha not too sure how to make one, sorry. You can try youtube. I have seen some people uploading vids on how they made their own hidden blade.